This report follows up our November, 2013 report which included airborne sound and impact isolation recommendations for the Birch Street Apartments located at 81 Birch Street in Abington, Massachusetts. The interior build out is underway and two units, one in the 1926 portion and one in the 1968 portion, were constructed for impact and airborne sound testing. 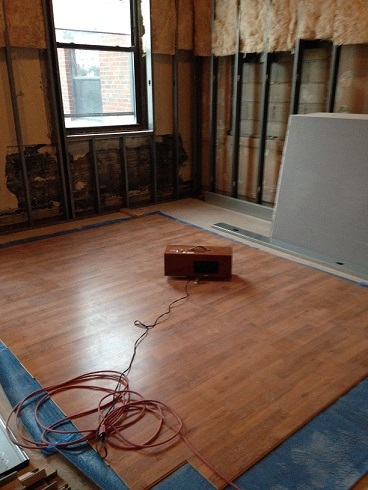 Our November 2013 report included two different sound isolation treatments for each building portion since the 1926 building does not require as much sound isolation as the 1968 portion. 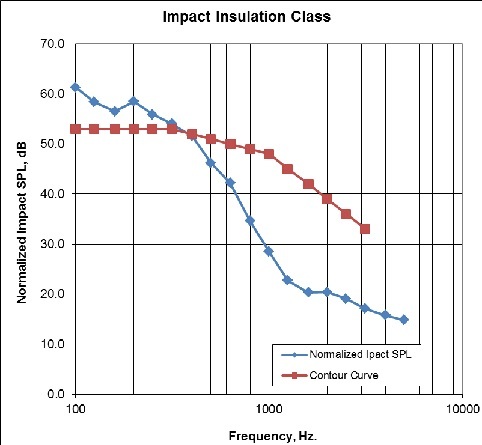 The Uniform Building Code requires an STC (Sound Transmission Classification) and IIC (Impact Insulation Classification) of 50 between units in multi-unit residential buildings. For in situ or “field tested” situations, UBC code requires FIIC 45. Based on a positive outcome of these tests, the tested treatments would be installed throughout the building. The 1968 building floor/ceiling assembly and treatment consists of 4” concrete, 12” airspace (bar joist), another 12” airspace, 6” fiberglass insulation, and 5/8” GWB connected to the bar joists via Armstrong IIC ceiling grid resilient hangers. 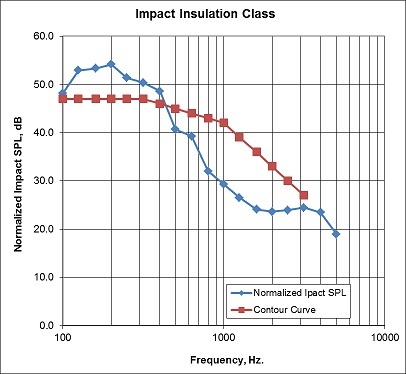 I conducted impact insulation testing in accordance with Standard Test Method for Field Measurement of Tapping Machine Impact Sound Transmission through Floor-Ceiling Assemblies and Associated Support Structures. (ASTM E 1007-04). A total of 16 1/3 octave band spectra are required, each associated with four different tapping machine positions and four microphone positions in the receiving room. In addition, the procedure calls for measurement of the RT60, the reverberation time of the receiving room (in this case, the lower floor units) to normalize the results to a standardized room absorption. Figure 1 shows the results of these tests for the 1968 part of the building. The data shown in Figure 1 corresponds with IIC 65 which is significantly greater than UBC requirements. Airborne sound refers to the transmission of sound from one space to another when there is no physical impact on the structure causing the sound. Examples of airborne sound would include voices and music playback systems. 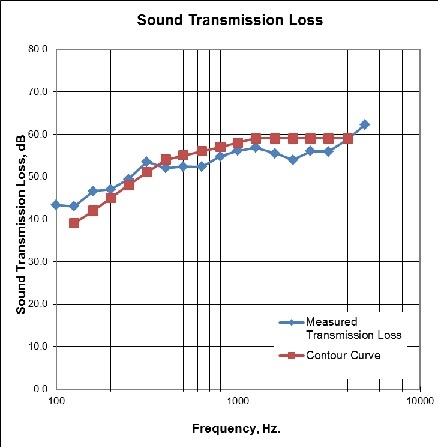 Sound Transmission Loss, the difference between noise levels in each unit, measures how effective the partition between units is in terms of airborne sound isolation. I measured the Sound Transmission Loss of the ceiling/floor partition by reproducing pink noise through a high performance sound system and measuring the difference in noise levels in 1/3 octave bands. 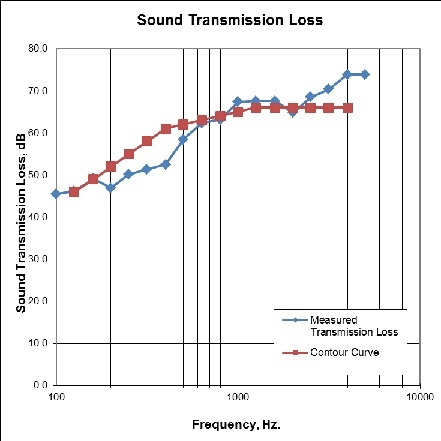 Figure 2 shows the measured Sound Transmission Loss in 1/3 octave bands for the ceiling/floor partition for the 1968 portion of the building. A single number value is obtained from this data in a similar manner as discussed in the Impact Sound section. This calculation results in STC 55 which meets the UBC STC requirement. During this test, sound from the test loudspeaker was audible both through the floor slab but also from the nearby stairwell. Since the first and second floor areas were under construction and not enclosed, sound from the stairwell flanking path very likely contaminated the test. If the test had been performed without this flanking path, the measured STC would have likely been higher than 55. The 1926 portion of the building floor/ceiling assembly consists of 2”- 7” concrete, 1 ½” airspace, a resilient RSIC clip/fastener, and 5/8” GWB. Figure 3 shows the results of the impact testing for the 1926 portion of the building. This data corresponds with IIC 59 which exceeds the UBC requirement. Figure 4 shows the results of the airborne sound test for the 1926 portion of the building. This data corresponds with STC 62 which exceeds the UBC requirement. In summary, both test units passed both impact and airborne sound tests by meeting or exceeding the UBC IIC and STC requirements.